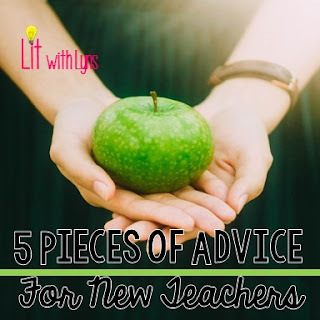 Check out these new teacher tips from today’s guest blogger Kristy from 2 Peas and a Dog. Kristy has been a middle school classroom teacher for 11 years in Canada. When she is not teaching she shares her teaching ideas on her blog and in her TPT store. I remember being a new teacher as if it were yesterday. (Why can’t it be yesterday? Now I feel old!) Those first five years were tough. I am forever grateful to the principal that hired me, but I was hired into a role with no resources and no support. Stick with this profession! It is hard, but the reward when you see the growth in your students from the start to the end of the year is worth all those tears (ok maybe not all those tears). Here are my five top pieces of honest advice for new teachers. 1. It is ok to cry. You are going to cry - just don’t cry in front of your students. Cry in the car, in the bathroom or at home. You can do it, but it will be tough! 2. Find places to get help. If you don’t have someone to help you at your school start looking around at other schools - ask other new teachers where they access support. Attend all of the new teacher professional development you are sent to. I made some great friends that I still have from those workshops. The internet has blossomed as a fantastic resource for teachers. Check out hashtags on Instagram #newteacher or #dearnewteacher You can also search for teaching related Facebook Groups. 3. Do not make your entire life about teaching. The summer I graduated from teacher’s college, I went garage sailing and thrift store shopping like it was my job. I was so excited to have a classroom that I forgot real life existed beyond those four walls. Remember your friends and family are the ones who supported you in your journey. 4. Your classroom will not be Instagram perfect - that’s ok! It is really hard to compare yourself to a teacher who has made a career out of classroom design. An organized and clean classroom is more effective than having a professional classroom design. It will come - focus on your teaching skills and curriculum knowledge first. 5. Enjoy your students. Find something special about each of your students - their taste in baseball teams, their reading habits, pets, hobbies etc and ask them about these regularly. Students want to know their teachers care about them. Looking for more new teacher tips? Check out this section on my website.